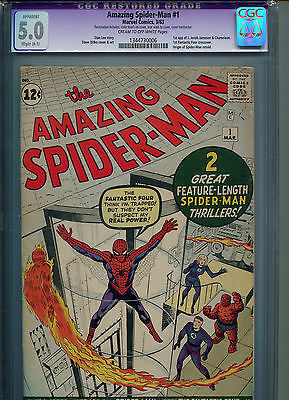 THIS IS THE TRUE FIRST AMAZING SPIDERMAN #1 1963 - SUPER HOT KEY - 1ST IN OWN TITLE - SEE PHOTOS. CGC GRADED 5.0 We are collectors not dealers and do not feel competent grading, therefore the pictures you see are of the actual comic. We ship worldwide in secure packaging, see our feedback, and will combine postage on multiple purchases. If buying more than one comic please wait for a combined shipping invoice before paying. Overseas buyers please e-mail for costs. Items are sent second-class standard in the UK and unless recorded is paid for the items are sent at the buyers own risk. International items are sent air mail only and unless international tracked/signed is paid for the items are sent at the buyers own risk.additional comics international,please add 80p per comic. If buying additional comics in the UK, please add 80p per comic to a maximum of £10.99 for up to 15 comics. A reasonable time frame of one month between first and last comic purchased is applicable. Please let us know if you are bidding on additional comics . We our pricing comics to sell over the next 12 to 18 months, we will be listing thousands of titles from the 1950s up to the 1990s. Please bookmark us and keep checking back regularly, please enquire if you have any specific wants.